There have been a lot of firsts in the Nation’s Oldest City, but one that you may not expect is the first wax museum! No, not just the first wax museum in Florida, but the first in the United States! Established in 1948, the Potter’s Wax Museum in St. Augustine features over 160 wax sculptures and statues in its halls. Discover everything you need to know about this family-friendly museum! Are you looking for more great attractions, like the Potter’s Wax Museum in St. Augustine? Access our free Vacation Guide! Inside, you’ll find our recommendations for the best places to go in the Nation’s Oldest City. We’ve also listed our favorite restaurants and bars in town. It’s easy to plan your trip to St. Augustine when you use our free Vacation Guide! Potter’s Wax Museum was founded by George Potter in 1948. On a trip to London when he was a child, he visited the iconic Madame Tussaud’s Wax Museum. The museum impressed him so much that when he was a wealthy adult, he opened the first wax museum in the U.S. After his death, the museum was moved to the Old Drugstore in the historic district of St. Augustine. Today, the museum holds over 160 figures modeled after celebrities, athletes, and political figures. Potter’s Wax Museum is open every day of the week from 9:00 a.m. to 6:00 p.m. Admission is $10.59 for adults and $7.41 for children ages six to 12. The museum is just a five-minute walk from Agustin Inn and is one of the stops on the St. Augustine Old Town Trolley Tour. Due to its location near the Tolomato Cemetary, rumors have always flown as to whether Potter’s Wax Museum is haunted. Find out for yourself when you take the Ghost and Gravestones Trolley Tour, one of the best ghost tours in St. Augustine. During the tour, you’ll enjoy an after-dark visit to the museum’s Chamber of Horrors to hear about the famed pirate Andrew Ranson and his execution. After your trip to the Wax Museum of St. Augustine, head back to the Agustin Inn for a wonderful night of rest. We are just a five-minute walk from the museum and even closer to many of the other incredible attractions in town. No other bed and breakfast in St. Augustine combines a convenient location with fantastic amenities, luxurious guest rooms, and a friendly staff with local knowledge to share. Add to that an awesome selection of specials and packages, and you have the perfect place to stay during your St. Augustine vacation. 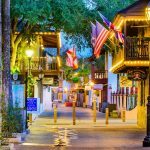 Are you looking for more great articles on St. Augustine attractions? Check out our blog! We’ve written features on everything from the St. Augustine Pirate and Treasure Museum to Ripley’s Believe it or Not in St. Augustine. Get the inside scoop on the best of the Nation’s Oldest City!